Sheila Viner, who is a member of the Mills Archive Trust, has been researching all the pre-1974 Berkshire watermills, and described the 20 Thames watermills from Old Windsor upstream to Sonning, and then 8 further water mills on the Berkshire part of the River Loddon. The watermills were used for a variety of industries (not just producing flour). The first mill on the River Thames within Berkshire (going up-stream) was that at Old Windsor. - thought to be the earliest known mill site in the county. Archaeological excavations have revealed that this had 3 vertical waterwheels that dated from the 9th century. It was served by a man-made leet about 1100m long. It was replaced by the Vikings by a Norse mill, which had a horizontal waterwheel. The excavation showed from the standard of the buildings and the types of objects found that this was a "high status" site - Old Windsor being a home for royalty in the Saxon period. However, when the Normans built a new castle further up-stream, people moved away from Old Windsor, and the mill fell into disuse. Mills were then provided nearer to the castle at Windsor and Eton. The Domesday survey of 1086 recorded two mills at Eton. One was close to Romney Lock possibly fed by an artificial cut originally provided for a source of water to the castle. In the mid 17th century, the mill was replaced by a new type of pump that was installed by Samuel Morland, to raise water (at the rate of 60 barrels an hour) to the castle. The Crown, however, failed to pay the bill for the machine! In due course, the Windsor Corporation gave the pump to Queen Anne - but she preferred water that was brought in pails from Chalvey, so the pumping engine went out of use. At the nearby Tangier Mill, the 10ft wide wheel not only drove the flour mill, but other machinery - used in Georgian times to make clay pipes for smoking, whilst Clewer Mill was a flour mill backing near the present Windsor racecourse. The boys of Eton were the bane of the miller's life here, as they would try boating on the tail-race when the miller was not looking! The mill house later became a private house - the actor Michael Caine enjoyed relaxing in its gardens, whilst a later owner was guitarist Jimmy Page of Black Sabbath. Further upstream was Bray Mill. It was not mentioned in the Domesday survey, but this may be because the Manor belonged to the Crown at that time. In the early 1200s the mill was given to Jordan de London, and it continued in use until the early 20th century. With the milling machinery removed, it became a private house. Taplow Mill was recorded as a fulling mill in the 14th century, but was for many years a paper mill, specialising in later years in corrugated card, producing 95,000 tons per year. Changes in world markets and the increasing costs of energy meant that the site (with surrounding properties) was sold in 2006 for over Â£30 million, although redevelopment plans have still not been approved. Not far away is Ray Mill. There were two mills listed in Cookham in the Domesday survey (there was no 'Maidenhead' as such then) - the Ray family being farmers and maltsters. In the 16th century, the mill was bought by Sir Thomas Bodley, who used its income to fund the Bodleian Library in Oxford. In 1909, it was sold to Lord Desborough, and a new pound lock constructed in 1912, with a boat slide provided to allow small craft to safely by-pass the lock. The last recorded miller at Ray Mill was Joseph Fuller, who died in 1917. The Venables of Cookham were associated with several mills in the area - (some on the River Wye towards High Wycombe). 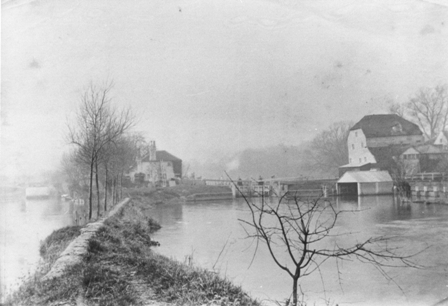 William Venables had a paper mill at Cookham Mill, on the Lulle Brook just below Cliveden, until the late 19th century. That became a recording studio in more recent times - offered for sale a few years ago at £million, it did not sell. Nearby (although actually on the River Wye) is Hedsor Mill. In 1800, there were 430 watermills in the country that made paper 'by hand', but with the introduction of steam power this had fallen to 250 by 1884. Few hand-made paper mills survived much later than this - but Hedsor was one such. For many years owned by the Lunnon family, it specialised in boards made using old rope, and was said to be the favourite board used by bookbinders. It closed in the 1920s. Mills would change their 'product' according to the economic times. At Marlow the jumble of buildings, in addition to use as a sawmill, oil mill, corn mill and paper mill, also worked as a thimble mill. Thimbles had been made in the past by laboriously knocking a nail into the surface to make the indentations. A knurling machine was invented by John Lofting, and installed at Marlow, where it revolutionised the manufacture of thimbles - turning out 2 million a year from 1734 to 1746. The introduction of large steam driven mills in Birmingham however meant that Marlow changed to producing oils. The entire site was demolished in 1965 to be replaced by modern flats. As elsewhere, Sheila remarked on the loss of jobs, and wondered where those who had worked the mills had gone. Next upstream was Temple Mill at Bisham, another large user of water. It is thought that the Knights Templar made chain mail there, and in the 17th and 18th centuries it became a brass mill - Daniel Defoe wrote of it as the Bisham Batterie. A 'copper baron' from Anglesey - Mr Williams - bought it at the time the Thames and Severn canal was being built - that giving a route to ship the ingots to Bisham. Brass and copper was an important material - not only for domestic wares, but it was used as sheathing for Nelson's warships, which were able to go faster as a result. By 1875, Temple had become a paper mill - a William Ellis being recorded as moving from Devon to work there in 1875. He remained for 48 years - just one of several 'people' stories Sheila included. The mill moved to fibre tube production in the 20th century, until it closed in the 1960s. A common hazard for mills was fire. Next upstream from Temple was Hurley, which was rebuilt after a fire in 1887, but a further fire in 1904 saw the mill close - the site is now occupied by Freebody the boatbuilding firm. The early millers had also to tend the weirs. They were required to stop milling, dismantle part of the weir, removing some of the rymers, to let the boat pass - when a lot of water would rush through (hence the term "flash lock"). Once the boat had passed, and the weir rebuilt, he would have to wait for a head of water to build up again before he could resume milling. That could take several hours --- although a barge might have to wait several days for a passage! As there was not much of an embankment to the river, a miller might use a capstan winch to help pull a boat through - one of which remains in a garden at Danesfield. Hambleden Mill still has a turbine in place, although most of the other machinery has been removed, as the site is now a boatyard. Further up-stream, at Henley, little Peelfold Mill (close to Marsh Lock) was mainly used as a paper mill, but now generates electricity for the Mill House and its neighbours. Almost opposite, on the Berkshire bank, was Marsh Mill. Originally used as a flour mill, it later made paper, and then animal feed, but has was replaced by flats. The Dewe and Paize families were amongst those who worked there - as with many milling families, they inter-married and so had involvement in mills elsewhere. Shiplake Mill is now a derelict site, still owned by the Phillimore family. There had been two mills there - a corn mill and a steam driven paper mill - and the area around what remains has recently been cleared. Further up, at Sonning, Daniel May was for a long time the miller - the Mays being another family with interests in many mills. A lot of the flour produced there was sent to Huntley and Palmers, in Reading. As bakeries were merged into larger concerns, such as Allied Bakeries, with large factories, so the milling also moved to large roller mills in docklands - thus losing many local jobs. After it ceased to be used as a working mill it was converted into a dinner-theatre. Moving into the Loddon, which of course opens into the Thames at Wargrave, it may be that Wargrave Mill, mentioned in the Domesday survey, was located there. As the mill ceased to exist long before detailed maps were made, its location is not known! Osiers were an important crop in the area, as they were used to make eel bucks - woven wicker traps that were placed at many local weirs - the eels being a prized catch. The Twyford area of the Loddon had a strong trade in the osiers. In Twyford itself, there had been a mill since the 14th century. Later there was a large flour mill, which had its own railway line built during the time it was owned by Mr Davis. When this mill was built, it was a 'grand edifice' described by a 3 page article in the Miller's Journal. It later burnt down, and was rebuilt, and became an animal feed mill for the Berks, Bucks and Oxon Farmers. After that closed, a housing development called Silk Mill was built on the site - although Twyford's silk mill had been on the other side of the road. Further up the Loddon was Whistley Mill. There had been a mill there since before the Domesday Survey, owned by Abingdon Abbey, (the Domesday Survey mentions 250 eels and a 'fishery worth 300 eels). By 1723, it had become a paper mill, but was demolished to enable gravel extraction. It is still possible to walk from Twyford Mill to here, and on to the next mill, at Sandford. The latter was also owned by Mr Davis, and was a small corn mill. Further up the Loddon was Sindlesham Mill, where two water wheels provided the power. It had been built by the Simmonds family. The building still stands, and outside are some upright millstones. These would be worked in a tub to crush barley for the brewing industry (Simmonds being noted local brewers). Later it was used to mill flour for Huntley and Palmers in Reading. Beyond Sindlesham, at Arborfield, were 2 mills. The corn mill had an 8ft x 10ft breastshot wheel, and there was also a paper mill. As often with mills, fire took its hold on more than one occasion. The paper mill was noted in the 1850s for 'best air dried brown paper' the openings in the side of the mill for the drying frames giving a distinctive appearance to this type of mill. Later it advertised 'cylinder dried rope browns'. A plan to install steam power in the 1860s did not meet with the approval of John Hargreaves, the land owner. Eventually, the chimneys were built, on condition that only smokeless fuels were used. Further up the Loddon was Sheepbridge Mill, at Swallowfield. It had ceased work as a mill, and had become a store, when it burnt down in 1966. The last of the mills on the Berkshire section of the River Loddon was Stanford End Mill, right on the Hampshire border near the 'Devil's Highway. Built in early Victorian times on the Stratfield Saye estate, its machinery is still in place. However, as the weirs have been changed to suit the local angling club, the building is now used as a store, and unlikely to work as a mill again.